Christian Lopez had just finished high school when his debut album Onward made him a standout in roots music circles. The album felt uncannily poised and wise beyond its years – an indie-folk throwback of worldly, self-written songs and old-soul vocals with tracks like "Morning Rise" and "The Man I Was Before" presenting powerful ideas of what a mature relationship might look like. Lead single "Will I See You Again" also garnered more than a million Spotify streams on the strength of its infectious hooks and simple-but-insightful lyrics. Christian Lopez had substantial buzz around him leading into AmericanaFest, so it was only fitting he'd play one of the week's many kickoff parties. Held at Razor & Tie's office just south of Nashville, the mid-afternoon event was packed out for Lopez, who played as part of an acoustic three-piece. The young West Virginia native had no trouble filling the room, with the intimate setting allowing the crowd to see him effortlessly modulate between a gritty Americana croon and a soulful brand of modern rockabilly. Lopez's set was short, but he managed to squeeze in a few new tracks, like the infectious "1972," from his forthcoming album Red Arrow. He also made a famous new fan in Beatle Bob, a beloved St. Louis cult figure who spent the half hour dancing and twisting along next to the stage. B.M. Christian Lopez will release his forthcoming record Red Arrow on September 22 via Blaster Records and today we premiere another track from the project, "Caramel." The song finds Lopez teaming up with Kenneth Pattengale of The Milk Carton Kids, an experience that Lopez said happened "totally by chance" after meeting in Nashville. Christian Lopez’s 2015 debut album Onward positioned the Nashville-by-way-of-West-Virginia songwriter as an artist to watch. The Dave Cobb-produced album showed Lopez to be a talented storyteller, vocalist, and guitarist, and got the attention of NPR, No Depression, and all of us at American Songwriter. CMT Premieres New Video for "Don't Wanna Say Goodnight"
Rolling Stone names Christian Lopez one of the "10 New Country Artists You Need To Know" and premieres new track "Swim The River"
Why You Should Pay Attention: Christian Lopez has only made two albums (his second, Red Arrow, comes out September 22nd), but the West Virginia tunesmith has already worked with two of the most respected roots producers in the business – first Dave Cobb (Jason Isbell, Chris Stapleton) and now Marshall Altman (Will Hoge, Frankie Ballard's El Rio). Only 21, he's crossed the 1 million Spotify streams threshold with "Will I See You Again," and by mixing joyful country and folk-rock with an upbeat pop sensibility on Red Arrow, he's poised for his breakout moment. 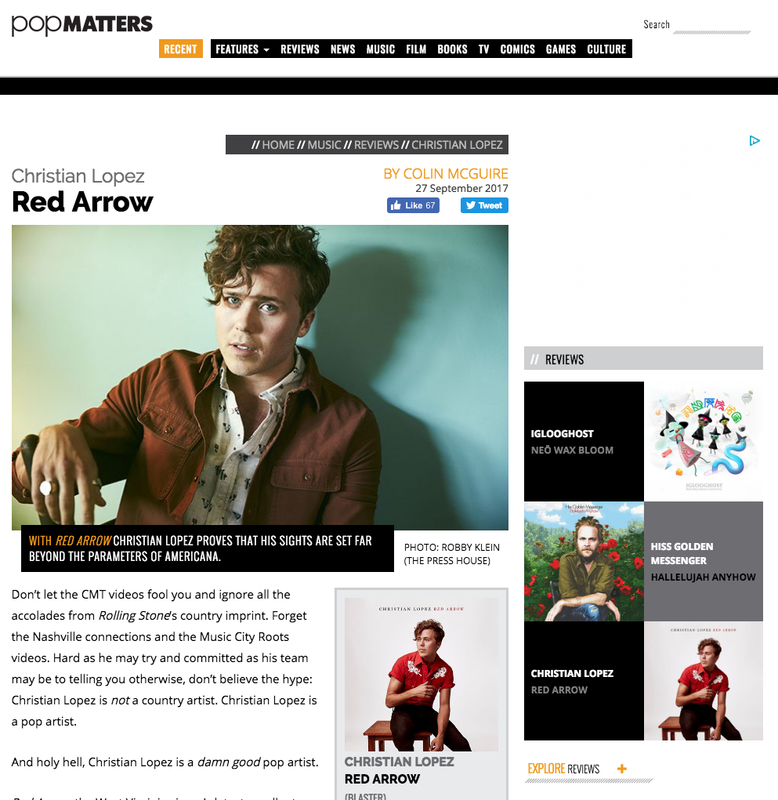 read full article & hear "Swim The River"
Razor & Tie Music Publishing has added singer-songwriter Christian Lopez to its roster. Lopez, who is managed by Rock Ridge Music, released his debut full-length album Onward via Blaster Records in 2015. The project was produced by Dave Cobb. Rolling Stone's "22 Best Things We Saw At Americana Music Fest"